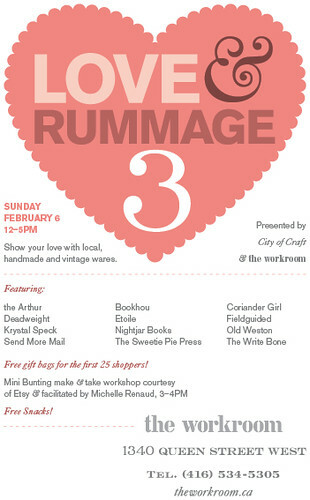 The Love & Rummage Trunk Show weekend is finally here! This year will mark the fourth year we have done this annual Valentines event with City of Craft. (OMG… this means this is the workroom‘s fourth year of existence!!!!) For me, this is always a wonderfully cheery event in the middle of the long winter. I absolutely LOVE that frigid temperatures, snow storms and the fact that we keep scheduling it on Super Bowl Sunday don’t seem to deter crowds of you from dropping by to support our favourite local artists at this love-filled show. For the early birds, there are gift bags available to the first 25 shoppers. Plus, a cute mini bunting make & take workshop sponsored by Etsy and facilitated by Michelle Renaud from 3-4pm. City of Craft has been posting vendor profiles, so you can get a sneak peek of all the fun you can expect on Sunday!! Are you coming? I hope so! um, YES! i always look forward to all the trunk shows! I’m coming(and hoping to be an early bird)! I can’t wait! So many great people in one room!